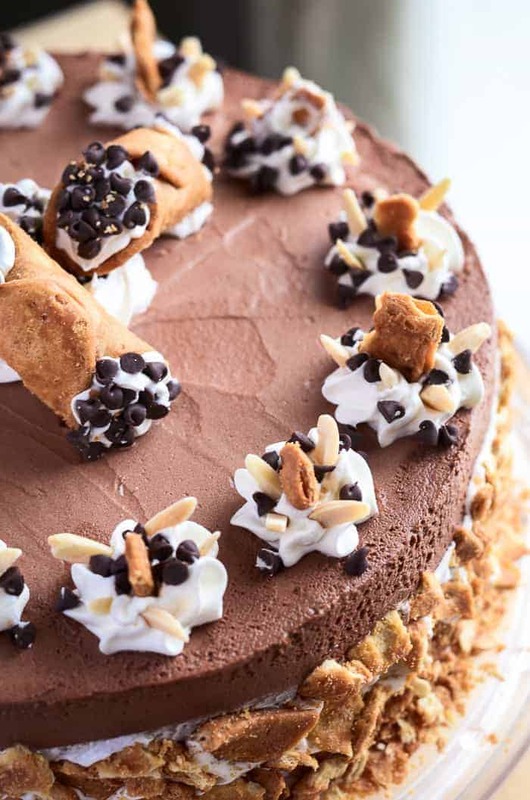 This fantastically decadent cake combines four very different desserts in to one – brownie, cheesecake, cannoli, and chocolate mousse! 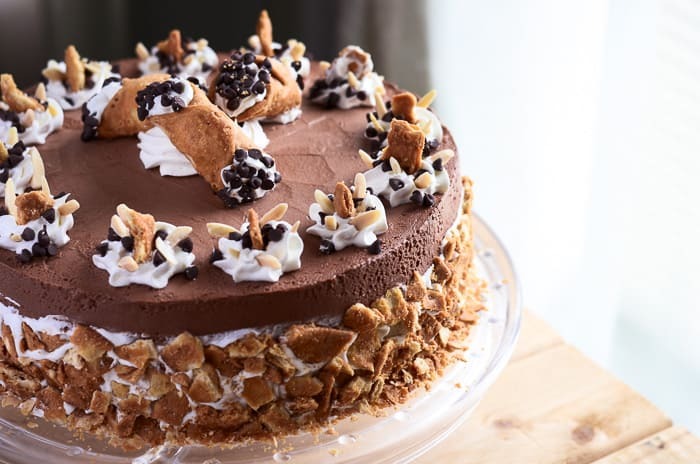 Chocolate Cannoli Cheesecake Mousse Torte. Chocolate. Cannoli. Cheesecake. Mousse. 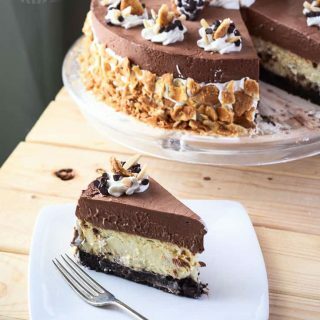 Torte. If I asked you to make a list of your favorite desserts, which of those things would be on it? That’s pretty much my list right there. The only thing missing is cupcakes and apple crumb pie. So, say that list is also similar to yours. If this cake were to turn up on your table for a holiday or a party or a random social gathering or Sunday dessert… you’d eat it, right? No questions asked. …then we are kindred spirits in sweets, and you’ll just love this thang! I was pretty proud of myself on this one, I must say. Considering the work (and half bottle of Cabernet) that went in to its fruition, I call it a major success. Picture this. It’s the day before Easter, and you’ve been so busy at work, you realize you still haven’t figured out what to make for Sunday’s dessert – a dessert you traditionally bring to the not-so-traditional celebration you’re a part of every year. You’re racking your brain, trying to come up with something grandiose and unique and crowd pleasing, and going back and forth between light and fruity for spring, or deep and rich just because you know everyone will love it. You spend the day fishing for opinions from your coworkers, and when you end up without a consensus, you’re left wandering around the jamming grocery store at 6pm, on your way home after a very long day, frustrated, tired, and still without any clue of what you’re going to make. So you just start grabbing things. Ricotta and cream cheese, oranges and whipping cream, a box of lazy brownie mix and a bag of sugar, thinking that no matter which direction you decide to go, you’ll be sure to have everything you could possibly need. Someone mentioned homemade cannolis, so you grab some shells from the bakery (because ain’t nobody got time for homemade shells) as you head to the checkout lanes, all fifteen of which are backed up at least five people deep. You take a deep breath, pick the least offensive lane (slim pickins), and stare off in to the distance, inching forward with your hand cart full of miscellaneous goods. Still pondering. That was my Easter Saturday. When I finally got home, I had made the decision that dessert would involve cheesecake, but I really wanted to involve that lazy box of brownie mix. Cannolis. Alright. 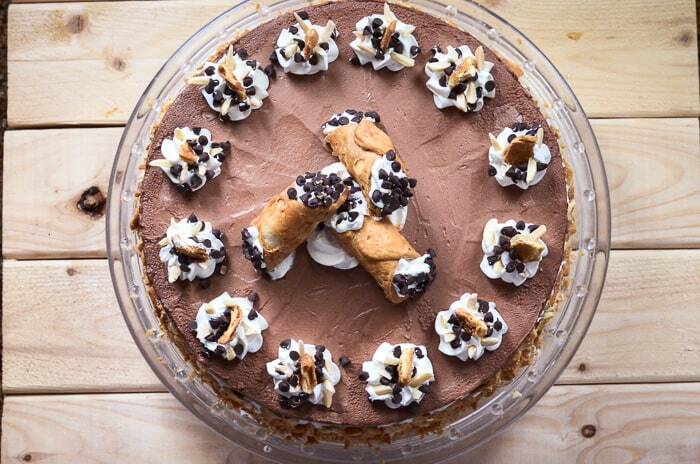 Next layer…cannoli cheesecake? Sub some of the cream cheese out for ricotta. Toss in some chocolate chips and orange zest? Why not. Twenty-five minutes. Ding. Brownie out, cheesecake on top, another trip in the oven for a couple more hours. Hmm. Another glass of wine. After debating whether or not to press a layer of crushed cannoli shells on the top of the cheesecake (not – they would have lost their crunch from the fridge condensation), I felt like I could finally breathe. Except all I wanted to do was sleep…but I had to wait until the cheesecake reached room temperature to put it in the refrigerator. So, I numbed my brain on Pinterest for a while. At last, 1am rolled around and I crawled in to bed, my half-made dessert wrapped up tight in the fridge. And a short six hours later, my alarm woke me up to finish the job. The little sleep I got did a lot for me, apparently, because I cranked out the rest of my vision in short order, with enough time to make my traditional Polish Easter breakfast before Mr. Crumby woke up at 10am. Not too shabby for a dessert that I was clueless about twenty-four hours earlier. And believe me, there were many wide eyes and dropped jaws and ‘oohs’ and ‘aahs’ when I strutted in the house with that baby. 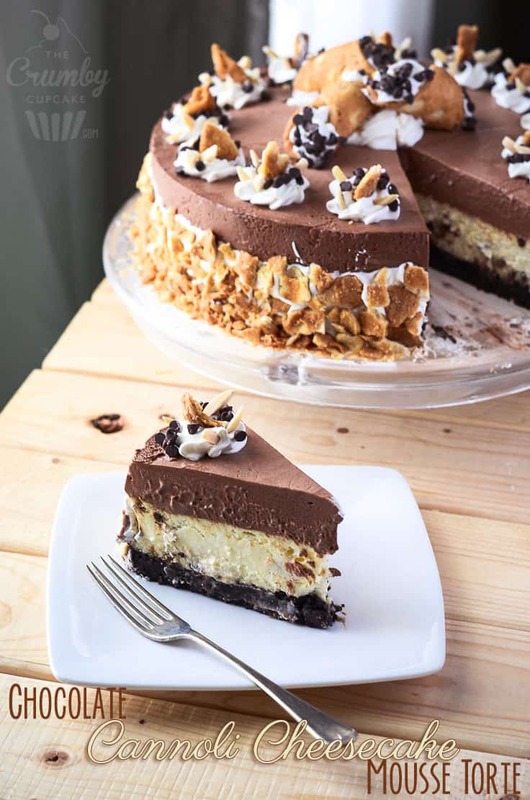 If you’re like me, a food adventurer, and marrying desserts is A-OK in your book, make this Chocolate Cannoli Cheesecake Mousse Torte. It may have been a half-baked idea at first, but the end result is abso-freaking-lutely delicious. It’s rich, decadent, somehow still light and fluffy, and definitely a one slice per person dessert. Out of eight of us, only two couldn’t finish their slice (believe it or not, I was one of them), and we still had a good quarter of the cake left to put away. It was so good, I (with the very vocal support of my dinner companions) decided to enter it in to a contest. I’m attending the Food & Wine Conference in Orlando this July as a brand ambassador (which I’ll go in to more detail about later this week.) Dixie Crystals, one of the conference’s platinum sponsors, holds a dessert contest every year, and the theme for 2015 is chocolate desserts. Well. This crazy thing totally qualifies. A little update – So I DID submit this into the Dixie Crystals contest…and took third place!! This baby is an award winner, y’all!!! 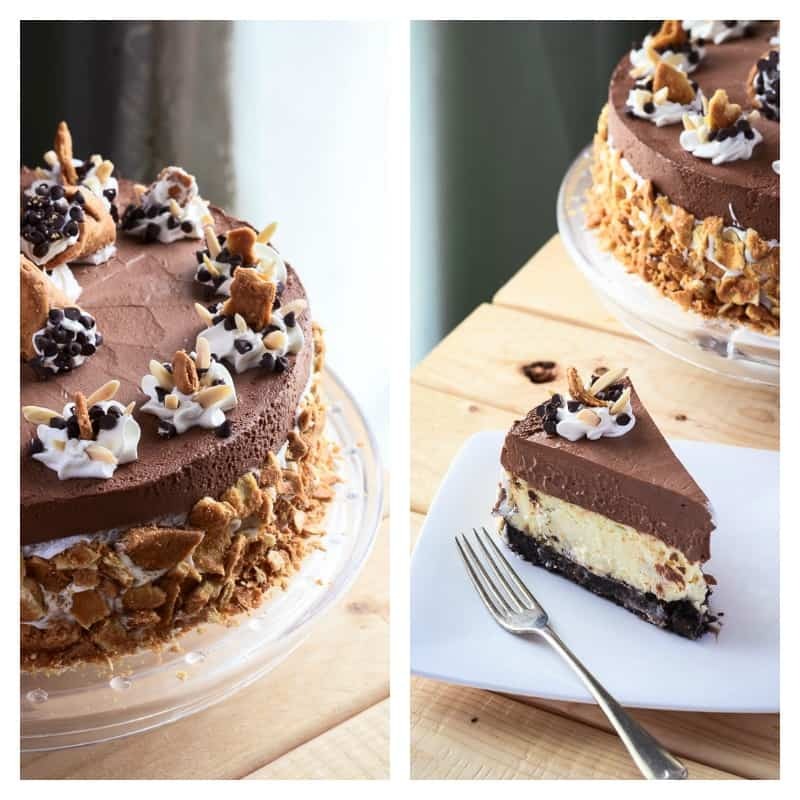 Chocolate Cannoli Cheesecake Mousse Torte | This fantastically decadent cake combines four very different desserts in to one - brownie, cheesecake, cannoli, and chocolate mousse! Preheat the oven to 350 degrees F. Prepare a 10-inch springform pan; line the bottom with a circle of parchment, then grease the bottom and sides with cooking spray. Set aside. Pour batter in springform pan and bake according to box (mine took about 25 minutes); you want the brownie to be just barely done, since it will be going back in the oven for over an hour. When brownie cools enough to touch, wrap the bottom half of the pan in 2-3 layers of foil and set inside a roasting pan. Set aside. While brownie is baking, prepare cheesecake. In the bowl of a stand mixer fitted with a paddle attachment, beat the sugar and cream cheese on medium speed until smooth, about 3 minutes. Add ricotta, salt, vanilla and orange zest. Mix well, about 2-3 more minutes. Add eggs in one at a time on low speed, mixing until batter is just blended. Drop the flour in the measuring cup of chocolate chips and shake to coat, then fold them in to the cheesecake batter. Pour batter on top of brownie "crust", spreading with a rubber spatula to even it out. Set roasting pan on the middle rack, and pour hot water into the pan, until it reaches an inch up the springform pan. Bake 50-70 minutes (ovens vary), until the edges have started to pull away, but the middle still ha s a slight jiggle. Turn heat off and open the oven door a crack, allowing the cheesecake to sit another hour in the cooling oven. After cheesecake comes to room temperature, cover with plastic wrap and refrigerate overnight, or at least 6 hours. DO NOT START THIS MOUSSE UNTIL YOUR CHEESECAKE HAS BEEN REFRIGERATED. In a small bowl, sprinkle powdered gelatin over rum. Let set 5-6 minutes. Set dark chocolate in a large bowl. Heat ¾ cup of heavy whipping cream in a microwave, or a small saucepan over low heat. When it's almost boiling, whisk in the gelatin until dissolved, then pour it over the chocolate and allow to sit for 1 minute before whisking until smooth and shiny. Set aside to cool. In a clean, cold stand mixer bowl fitted with a whisk attachment, whip the remaining 1½ cups heavy cream on high until it begins to thicken. Add almond extract and confectioner's sugar, and whip until mixture reaches stiff peaks. Don't overwhip! Fold ⅓ of the whipped cream in to the cooling chocolate mixture gently until incorporated, then fold in the remaining whipped cream until color is uniform. Pour mousse mixture on top of cheesecake, smoothing with a spatula to evenly distribute. Refrigerate at least 2 hours. Since the cheesecake pulls away from the pan, but the mousse does not, when you unhinge your pan ring, the layers will be uneven. Pipe prepared whipped cream around the brownie/cheesecake layers, then smooth with an offset spatula. 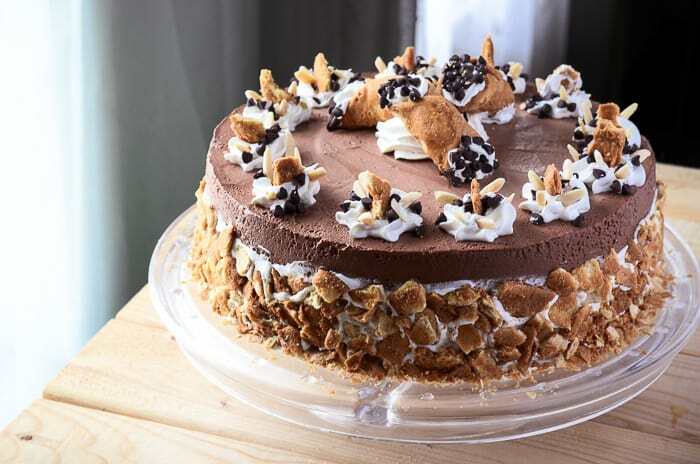 Press crushed cannoli shell pieces around edge of cake with your hand, going up as far as the vanilla whipped cream reaches. Pipe 12 dollops of whipped cream evenly around the top edge of the cake, and a final larger dollop in the middle. Place 3 whole miniature cannoli shells filled with more whipped cream artsy-fartsy-like on the center dollop. Garnish each outer dollop with a larger piece of crushed shell, mini chocolate chips, and almond slivers. Refrigerate at least another hour before serving, just so everything firms up. 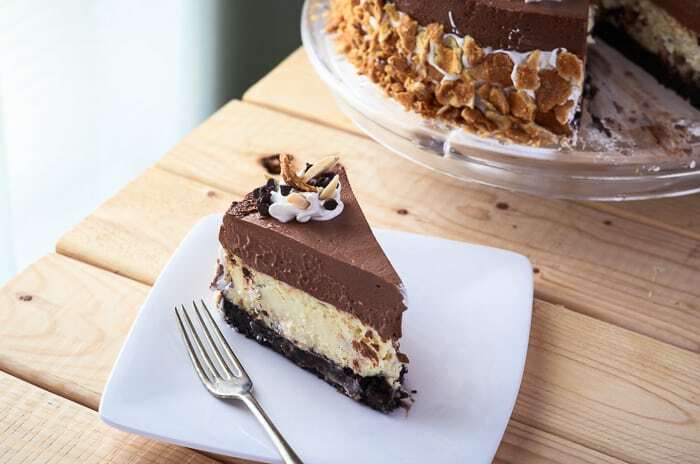 Slice, serve, and enjoy this amazing torte! What is your favorite way to mash up desserts? Wow! That is quite the amazing dessert! I love cannoli. I’ve got to find a special day to make this because it just sounds so, so good! OMG, Erica! This is the most beautiful dessert I have ever seen IN MY WHOLE LIFE. I’m in total awe! Okay…so you had me at the title. And then I look at the pictures! I know it won’t look as good when I try to make it, but I hope it tastes as good! This cake is a total master piece! I’m just starting to get into layered cakes so this is inspiring! talk about dedication to finish a cheesecake!! But by the looks of this beauty, it was worth every effort you took to make it! Girl, you are out of control! This dessert combines so many of my favorite flavors. I’ve never tried making homemade cheesecake, but I’ve been meaning to give it a try. This definitely sounds like a recipe I need to make. YUM! Welp! There goes my wedding diet. I pinned this and hope to accomplish it myself one day. I am living for those photos! Awwww…Erica! This is beautiful and I just want to look, enjoy, and taste – skip the putting together part – I could only make it this beautiful if you were there helping me! Holy cow! What an insanely awesome looking dessert!!! I love how you put all these desserts into one fabulous looking torte!!! Um WOW! I am so envious that you have such talent! This is stunning and It looks so yummy! You’re going to the food and wine conference? what city? I am so glad that slobbering over a beautiful picture of chocolate does not make you gain weight! This looks amazing. What a dessert! I would have to call this a success it looks absolutely delicious and so elegant. I love cheesecake but I don’t know if I would have had the patience to pull this off so successfully. This looks like you just bought it from the bakery!! Stunning – Too good to eat! So I’m an ok cook, but a terrible baker. I have a recipe that I follow to a tee – but the second time I make something, it comes out completely different. I don’t know what’s up at all. So I leave the baking to my best bud, and I do the cooking. It works out well for the both of us hahah. This dessert looks ridiculously delicious. It also looks way complicated to prepare. I take my hat off to you for your dedication to completing the recipe. Thank goodness you had wine during the epic baking process. OMG this looks delicious!! I think I need to step my dessert making skills up a notch. This looks so delicious. It actually looks professionally made so well done you! I’d actually love to have a slice of this right now. The brownie layer is genius, so much tastier than a crumbly biscuit base for sure! Lovely layers! What great flavors together! I can’t even! Oh my that looks so delicious. Chocolate is my weakness. This is so my kind of cheesecake though lately cheesecake has been giving me heartburn which is not fun. I hope you enjoy the conference and hope you cake wins. i should just throw my bikinis away after even looking at it. omg! im sure it tasted amazing, but i love how pretty all your desserts always look. good job! Wow that is just plain awesome! I never would have thought of this but BAM there it is and now I need this in my life! Also, your baking skills are amazing, I love how perfectly round the layers are! That looks insanely good! The only problem is… if I made it, I would eat the whole thing myself. Hold up …stop the presses! An Instant Pin! First off, that is one incredibly tasty-looking dessert here. I’d love to have a slice of that right NOW. Secondly, I’m kind of sad because I do not think that I would be able to make one as good as the one shown here. I think I just died and went to heaven. Everything about this is screaming “eat me now!” Going to have to pin this so I can drool some more later. I made the cake for Christmas and it turned out amazing!! Thanks for sharing the recipe it was a huge hit! I’m thrilled to hear that, Stephanie!! I still can’t top it – but that’s not to say I won’t keep trying! Hey!! I was wondering how you think making a cannoli crust would do with this recipe rather than the brownie crust? Hi Samantha! I don’t see why it wouldn’t work! It sounds delicious to me…if you make it, I’d love to know how it turned out!